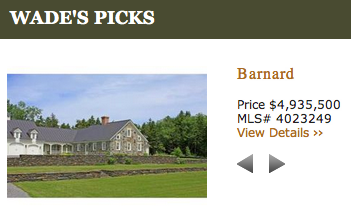 At no other time has a buyer had such easy access to Vermont real estate data as with todays internet content. On my website you can access all of Sotheby’s International Realty listings, all listings in the Multiple Listing Service (MLS) and many that may be outside the mainstream in Wade’s Picks. You also have access to Sales Data of all Vermont real estate sales since 1986. However, as with all data, interpretation is important to insure the correct perspective. Here at Wade I. Treadway, I am available via email or phone to assist in filling in the gaps and to insure accurate correlation of the information. Information that is not only relevant but also important to a buyer is also contained within this website. Every buyer has an image of that perfect Vermont property but it is vitally important to view that image within the context of individual needs. Whether they are recreational, cultural, educational or medical, I can help to ensure that that perfect Vermont property is located in an appropriate area for your individual needs.